After you’ve entered contact information on your iPhone 4S, you can share it with others via an e-mail message. With Contacts open, tap a contact name to display its information. On the information page, scroll down and tap the Share Contact button. In the dialog that appears, tap Email. A New Message form appears. You can also share a contact using a text message. Tap the Share Contact button and then tap Message. The Messages app opens to a New Message screen; the contact you’re sharing already appears in the message’s body, so all you have to do is add a recipient in the To field and tap Send. 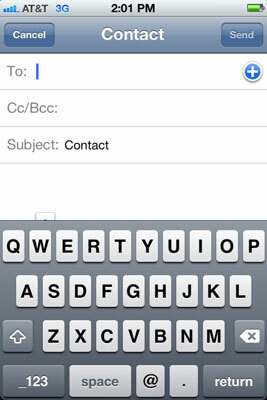 In the New Message form use the onscreen keyboard to enter the recipient’s e-mail address. Note if the person is saved in Contacts, just type his or her name here. Enter information in the Subject field. If you like, enter a message and then tap the Send button. When somebody receives a vCard containing contact information, he or she needs only to click the attached file to open it. At this point, depending on the e-mail or contact management program, the recipient can perform various actions to save the content. Other iPhone, iPod touch, or iPhone users can easily import .vcf records into their own Contacts apps.